How lucky I am to work with a great team of people! This year I decided to make proper invitations to the Christmas dinner. 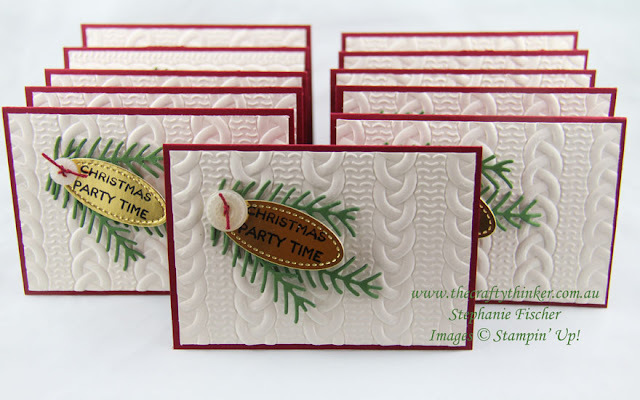 Each invitation is made from 1/4 of a piece of Cherry Cobbler cardstock folded in half. 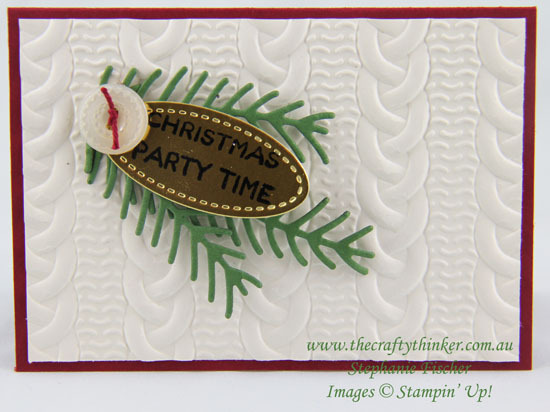 To this I added a layer of Very Vanilla cardstock which I first spritzed with a little water and embossed with the gorgeous Cable Knit Dynamic Textured Impressions Embossing Folder which gives an amazingly deep and crisp embossed pattern. I added some pine boughs and a Classy Designer Button (threaded with Cherry Cobbler twine) and voila - all finished in no time! So quick and easy to make!